Bowerbank, Maine is a small township located along Sebec Lake first established by Charles Vaughn. It was incorporated in 1839 but as its population dropped, it repealed it’s incorporation in 1889, and reorganized as a plantation in 1907. 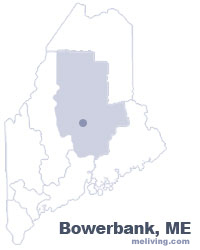 To share any Bowerbank, Maine information with us, please contact us. Learn more about advertising in MELiving.